Customize your choice of groundbreaking shovel on the head, the wooden shaft, and/or the handle grip. 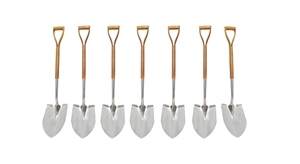 Select from our stainless steel or chromed shovels and personalize them with any desired design and/or text. We offer various options for customization. Your company logo and/or desired text can be printed in full-color directly on the shovel or you may choose to have an engraved plaque mounted on the head or stem to further embellish your lustrous shovel. For a cost-effective alternative, you may opt for full-color vinyl decals that are just as captivating. Simply enter your basic text or e-mail us the artwork; we will take care of the rest. You will receive a proof sample via e-mail before your order is processed to make sure custom options are up to your standard. Please allow 3-4 business days for processing. A set that you'd do well to have at your groundbreaking ceremony, this kit collects all the items that might be required and presents them to you in a single package. 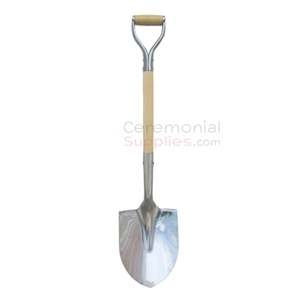 Your purchase includes a polished steel groundbreaking shovel (measuring 42 in. in length with 12 X 9 in. 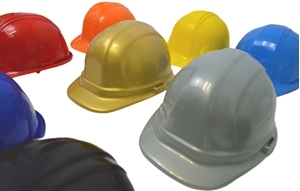 blade), a ceremonial hard hat and an 18 inch bow in a color of your choice: red, white, blue, orange or green. 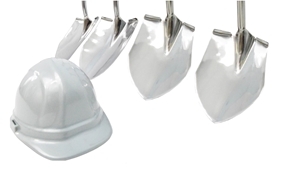 Want to personalize your hard hat and shovel? Have your logo and/or dedication text printed in full color directly on the shovel or add vinyl decal as a lower cost alternative! The ideal hard hat is both ornamental and useful. 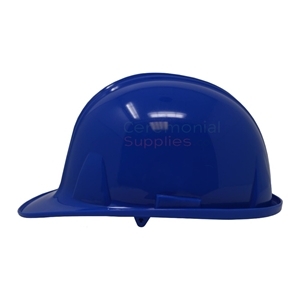 With its high density royal blue polyethylene shell that is blank for customization, and the combination of an adjustable pinlock suspension and replaceable soft brow pads, this hard hat checks both boxes. With the combination of its impressive 41.25 inch height, 9.5 inch blade width and a light 3.4 pound weight made to be wielded via a D-grip, this shovel is both utilitarian as well as striking. The polished wood handle and polished chrome finish shovel blade are simply the icing on the cake. A perfect mirror reflection an a smooth finished wooden stem make this a top choice among ceremonial groundbreaking shovels--truly meant for a VIP. 42 inch height and 9.5 inch blade width, weighing a total of 3.4 lbs. It compact size and light weight make it easy to handle for your VIP's comfort. A hard hat in a color that expresses power, this ceremonial groundbreaking red hard hat comes with a red colored high density polyethylene shell and is left blank to be customized per your needs. The adjustable pinlock suspension and replaceable brow pads further ensure the hard hat is ready for action post ceremony, thus imparting versatility. 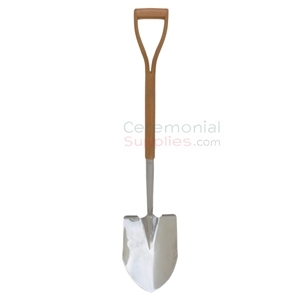 With its polished stainless steel blade and a dense red oak wood handle, this ceremonial shovel is a must have for your groundbreaking ceremony. Overall length of shovel is 42 inches and the blade's dimensions are 12 inches in length X 9 inches in width. The traditional D-grip handle guarantees ease of use. Green colored Steel head ceremonial Groundbreaking shovel with black metal D-style handle on wood grip. 42" high and 9.5" wide shovel head. Grip and stem are American ash wood. Shovel blade, stem, and handle can be customized with direct print or vinyl decal. Optional engraving plate of matching Green can be personalized for the stem. 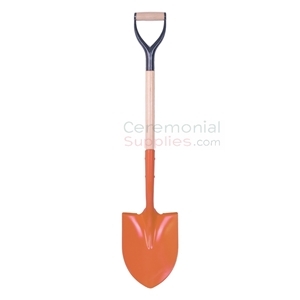 Orange Ceremonial Groundbreaking Shovel is 42" high with a 9.5" wide steel shovel blade (head). Handle is black metal, D-style with American ash wood grip and stem. Customization is optional for handle grip, wooden stem, or shovel blade. Groundbreaking Pink Color Steel shovel,shovel stem and grip made from American ash wood. Total height is 42" and the shovel blade is 9.5" wide. D-style handle is of black metal on wooden grip. Optional customization options direct print or decal on the handle grip, the wooden stem, shovel head, or all. Please note only single color logo for shovel head option. Red Color Steel Shovel Head blade is 9.5" wide with wooden stem constructed from American ash wood for total height of 42". Black metal D-style handle on wooden grip. Customization options available for the handle grip, the wooden stem, the red steel shovel head, or all three. 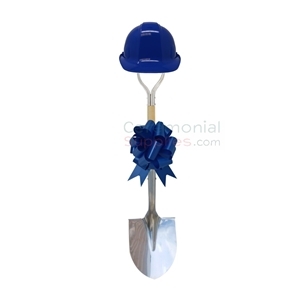 Royal Blue colored Steel head ceremonial Groundbreaking shovel with black metal D-style handle on wood grip. 42' high and 9.5' wide shovel head. The stem is of American wooden ash. Shovel blade, stem, and handle can be customized with direct print or vinyl decal. Optional engraving plate of matching blue can be personalized for the stem. 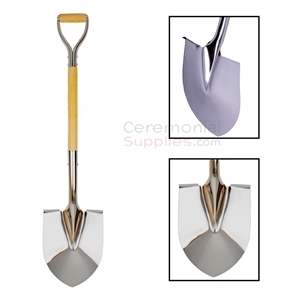 High-quality 42 inch (total length) chromed stainless steel shovel with white mohagony wooden D-Y handle. Polished finish gives it an appreciable shine that makes it fit for the grandeur of a groundbreaking ceremony. A 12X9.5 in head and a fully enclosed stem socket makes for a sturdy digging tool that does more than just look good! 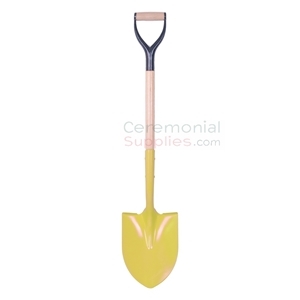 Yellow colored Steel blade ceremonial shovel is 42" in length with a 9.5" across the blade. Handle is D-style black metal with wooden grip, and stem is constructed from American ash wood. Can be customized on the handle grip with direct print or decal or logo and/or text on the wooden grip, on the wooden stem, or both. Shovel stem customized with direct print or an engraved yellow plate (silver plate or any other available color is optional). The Stainless Steel Long Handle Groundbreaking Shovel is our alternative to the D-Y and D-Grip. With a 12X9 inch head and a 58 inch long ash wood handle, this shovel stands tall to commemorate the beginning of your new construction project. A set that is essential at every groundbreaking ceremony, this kit collects all the necessary items that might be called for at a groundbreaking ceremony and presents them in a single package. 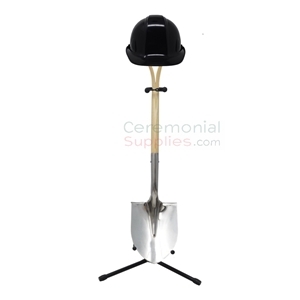 Your purchase includes a polished steel groundbreaking shovel, a display stand to accommodate the shovel and a ceremonial hard hat in a color of your choice, whether black, yellow, red, royal blue, light blue, hunter green or orange. An item that is both symbolic and functional, this ceremonial hard hat comes in a deep green color and is made of strong and dense polyethylene to give you the best of both worlds. Further enhancing its functionality are an adjustable pinlock suspension and a soft brow pad that is replaceable, whereas its blank shell provides you with aesthetic and marketing opportunities. A set of elegant groundbreaking accessories, this kit collects all the essential items that are needed at a groundbreaking ceremony and presents them in a simple package. 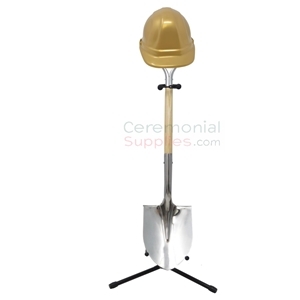 Your purchase includes a deluxe ceremonial groundbreaking shovel, a shovel display stand and a ceremonial hard hat in either of two luxurious colors - gold or silver. Made of high density polyethyelene, this bright white hard hat is a must-have for your groundbreaking ceremony. Intended to be both symbolic and useful, the adjustable pinlock suspension and replaceable brow pads ensure quality so that it can double up as a fully functional hard hat and a ceremonial groundbreaking accessory as the blank shell allows customizability. At the onset of a construction project, a groundbreaking ceremony is the best way to celebrate, thank and recognize the individuals that put in hard work to make it a fruitful endeavor. Groundbreakings and sod-cuttings are to the construction industry as the Oscars are to film—in terms of importance. Much like in Hollywood, ceremonial groundbreakings employ a red carpet stage to host the most valuable members involved in the project, and these are the individuals who have the honor of participating by taking the first shovel to the ground to initiate the project. Groundbreakings are a type of grand opening ceremony, which is why they are usually regarded as a special event to kick off a highly anticipated project. An audience is present and it is filled (ideally) with key members of your organization, your industry and press. A groundbreaking is an excellent PR opportunity for your company and a chance to commemorate what will hopefully become a historic moment. 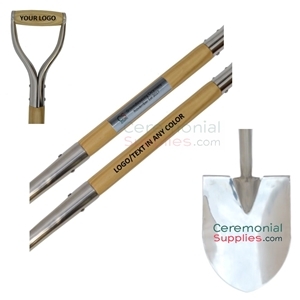 CeremonialSupplies.com can help you hold a praise-worthy groundbreaking or sod-cutting ceremony that will put a seal of authenticity on your project within your industry. Groundbreakings somewhat similar to ribbon cuttings; many of the accessories and decorations used are the same as those you would see at a grand opening. Red carpets are just as important in a groundbreaking because every project involves a special group of individuals who deserve to be honored. Stanchions and rope help with crowd control by designating a special area for the event’s MVPs to perform the ceremony; decorative bows (and even ribbon) help to beautify the venue to make for a picture perfect stage; banners, signs and flags help to promote your groundbreaking and decorate as well. 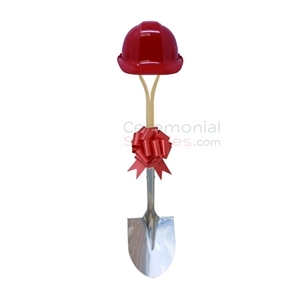 The real difference makers in a groundbreaking ceremony are the featured tools—a ceremonial shovel and a ceremonial hard hat. These are essentially the “ribbon and scissors” of a groundbreaking. 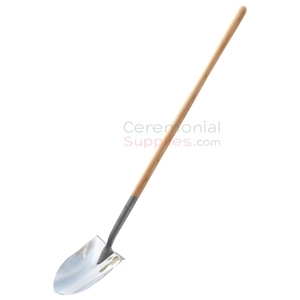 At CeremonialSupplies.com, you will find quality groundbreaking shovels, hard hats, decorations and accessories to have a triumphant first dig. Groundbreakings can be used to celebrate a variety of different construction or building projects. Whether it is the construction of a brand new building, the expansion of an existing facility or the restoration of a historic site, there is no better way to initiate the job. Starting a new construction project is a big deal! Just getting the project approved involves a series of—often painstaking—steps involving government permits, budgeting, and architectural challenges to name a few. This is why a groundbreaking ceremony is so special to builders. It takes the right individuals to team up and put together a successful plan. These are the individuals who need to be honored in a groundbreaking; be sure to use extraordinary ceremonial supplies, because these are far from ordinary people. 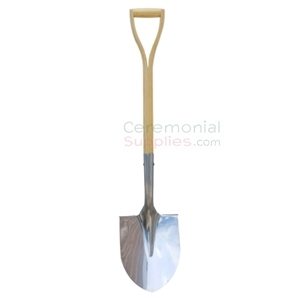 CeremonialSupplies.com is your best destination for quality groundbreaking and sod-cutting products. 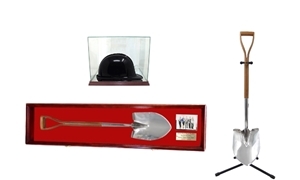 Our ceremonial shovels, hard hats and other construction tools are specially made to be used by the most important individuals in your firm. We also have groundbreaking accessories and décor that guarantee a picturesque stage for your attendees that will make for a picture that’s worth a thousand words!